The classic guide to self-sufficiency, with more than 200,000 copies sold—now fully updated! Anyone who wants to learn basic living skills—the kind employed by our forefathers—and adapt them for a better life in the twenty-first century need look no further than this eminently useful, full-color guide. 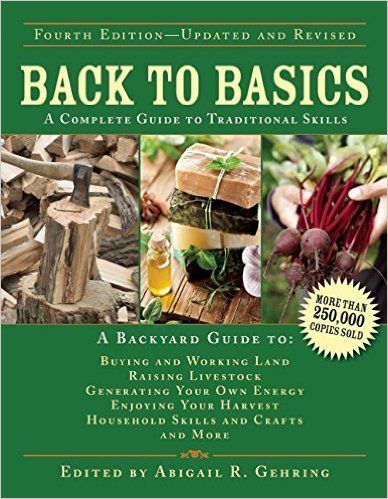 Countless readers have turned to Back to Basics for inspiration and instruction, escaping to an era before power saws and fast-food restaurants and rediscovering the pleasures and challenges of a healthier, greener, and more self-sufficient lifestyle. More than just practical advice, this is also a book for dreamers—even if you live in a city apartment, you will find your imagination sparked, and there’s no reason why you can’t, for example, make a loom and weave a rag rug. Complete with tips for old-fashioned fun (square dancing calls, homemade toys, and kayaking tips), this may be the most thorough book on voluntary simplicity available.